As the world turns to sustainability, solar enriches our lives. SAVING SUNSHINE takes a look at today's developments in solar electricity and its increasing role as power provider. Combining the best features of off-grid, stand-alone solar installations with grid-tied systems that provide distributed generation, photovoltaic systems have evolved into AC-coupled systems. They provide back-up, stand-alone electricity while also using renewable solar energy for our everyday electrical needs. This combination of renewable energy and energy storage connects multiple inverters with maintenance-free batteries and opens the door to energy independence in a sustainable, low-carbon future. Teachers, electricians, system installers, architects, owners of grid-tied systems and solar advocates will find the clear explanations in SAVING SUNSHINE helpful in learning the specifics of an AC-coupled system and how it forms a local distribution system to deliver electricity in a more reliable and environmentally friendly manner. "This is a very information-dense presentation that touches on many solar PV topics including the AC grid and the complicated AC coupled hybrid systems. I was impressed by the scope of information presented and the explanations were very clear. I would use this DVD in a more advanced PV course to ensure the students already had sufficient background to digest this excellent DVD." "Informative and appropriate for first-year engineering students. It would supplement material currently used for a home energy project where student teams improve a baseline house design to use less annual energy. This video provides a general overview to solar systems that are analyzed in more detail to optimize residential energy use." "An informative and realistic explanation of what it takes to truly live with PV...A stellar job - from introduction (where power comes from) to conclusion (I get it!) - explaining how solar electricity, grid power, and batteries can all work together...The audience is brought to this advanced level of understanding of PV systems through simple yet thorough explanations of series and parallel circuits, frequency, peak demand, autonomy, inverters, and batteries...If you're a PV educator or enthusiast, this DVD is one to keep in your library." "Informative...This timely DVD explores the uses of PV systems and how they can be tied to sustainability of normal domestic living as well as to lower the carbon footprint left by common electrical generating systems. Engineering college majors, teachers, electricians, and anyone contemplating a conversion to a grid-tied system are ideal candidates for this film." 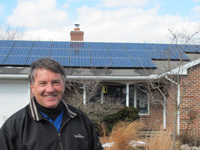 "Presents information needed to create a home based solar power system in a short 34 minutes...The host, Bruce Hankins - a master electrician and solar installer, is...very knowledgeable and clearly explains the concepts and installation process in an easy to follow manner. Saving Sunshine is recommended for entry-level engineering classes or those interested in installing their own residential solar powered electricity system." "Enlightening...Thoroughly accessible to viewers of all backgrounds, Saving Sunshine is an excellent informational resource, ideal for public and community library environmental studies collections." "[A] nuts-and-bolts examination of a Pennsylvania home...Carefully explore[s] the considerations that must be taken into account by those interested in shifting to a modified solar power system, and he offers a promising message about the possibility of sustainable energy independence." Language options: SDH captions in English for the deaf and hard-of-hearing and subtitles in Spanish. Also scene selection. "Saving Sunshine is an excellent DVD for those of us who are not electricians, electrical, or mechanical engineers, but are very interested in learning more about how solar PVs can be installed, with a battery back-up system, to provide emergency power. Bruce Hankins explains, using clear, easy to understand wording and examples, how the system is built and works. We recently installed a solar, battery back-up system and I am a much more informed system owner because of this DVD...I highly recommend it."